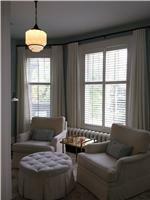 Some photos of our previous work creating custom wave style window coverings and window treatments. We're more than just a fabric store! Here are some photos showcasing our wallpaper installed in homes. Take a look at our album containing our previous work creating custom pinch pleated window coverings and window treatments. A selection of our previous work creating custom inverted box pleat window coverings and window treatments.